Meet Joey! He is an 10 month old 60 lb. black and white Lab cross. 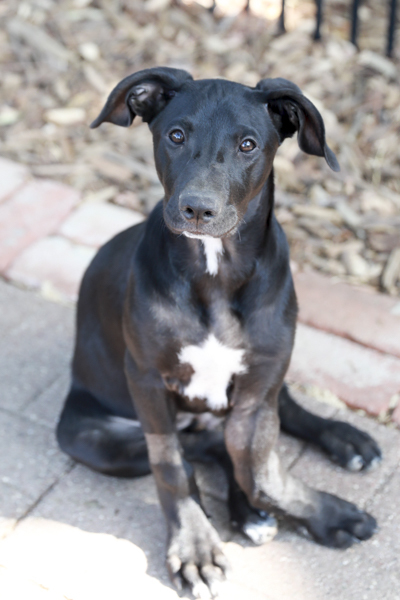 Joey has an amazing kind and playful personality in spite of his rough start as a young puppy. He has been a volunteer favorite since his arrival due to his courage and stoic personality. Joey was dumped at the shelter when he was about 8 weeks old with a broken leg. The Vet at the shelter estimated that the leg was broken when he was about 6 weeks old. Once he was rescued, Joey remained in foster care over the next few months so the veterinarian and surgeons could monitor his growth and healing. Now he is 10 mths. old, full grown and his leg is healed. The leg isn’t perfect but then again, who is. The surgeon has determined that surgery will not be needed and is ready to find his forever home. Joey uses his bad leg to walk and run but should be monitored and could need additional medical attention in the future. Joey is very smart and willing to please. He is a low/medium energy who gets along with other dogs big and small. He would love to have a playmate, but he would also be happy as an only dog. Joey has great house manners, is house trained, sleeps through the night and just a joy to have around. His past times include chewing bones or treats, playing tug with his human, going for rides in the car or just laying on his dog bed beside you. He knows all his basic commands – sit, down, wait, watch me, come and can catch treats in the air. Joey enjoys short walks but due to his leg injury would not be a suitable hiking companion or running partner. He has been attending nose work classes and is just a natural. Joey is looking for quiet home with someone who understands his minor limitations and loves his sweet kisses. No homes with flights of stairs or pools, please. When you look into Joey’s eyes, you will see what we all see – a kind loving boy who will give you tons of love for years to come. Joey is neutered, micro-chipped, and up to date on all shots. For more information go to www.3rrescue.org or phone 707-529-4643 or email: adopt@3rrescue.org.